Question: The magnitude of the electric field strength between two oppositely charged parallel metal plates is 2.0×103 newtons per coulomb. Point P is located midway between the plates. (A) Sketch at least five electric field lines to represent the field between the two oppositely charged plates. (B) An electron is located at point P between the plates. Calculate the magnitude of the force exerted on the electron by the electric field. 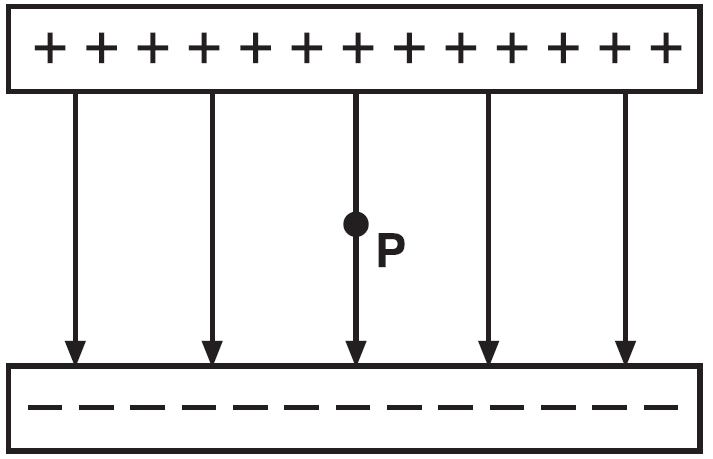 Parallel conducting plates separated by an insulator can be used to store electrical charge. These devices come in a variety of sizes, and are known as parallel plate capacitors. The amount of charge a capacitor can store on a single plate for a given amount of potential difference across the plates is known as the device’s capacitance, given in coulombs per volt, also known as a Farad (F). A Farad is a very large amount of capacitance, therefore most capacitors have values in the microFarad, nanoFarad, and even picoFarad ranges. Question: A capacitor stores 3 microcoulombs of charge with a potential difference of 1.5 volts across the plates. What is the capacitance? Question: How much charge sits on the top plate of a 200 nF capacitor when charged to a potential difference of 6 volts? The amount of charge a capacitor can hold is determined by its geometry as well as the insulating material between the plates. The capacitance is directly related to the area of the plates, and inversely related to the separation between the plates, as shown in the formula below. The permittivity of an insulator (ε) describes the insulator’s resistance to the creation of an electric field, and is equal to 8.85×10-12 Farads per meter for an air-gap capacitor. Question: Find the capacitance of two parallel plates of length 1 millimeter and width 2 millimeters if they are separated by 3 micrometers of air.